We charge all of our cars out at the same rate of £80 per hour (with the exception of the Aston Martin DB5 and the Rolls Royce) from and returning to our base at Wrangaton TQ10 9GQ. The minimum time is 3 hours i.e £240 this would cover a local wedding, taking the bride to the ceremony, then the happy couple to the reception with time for plenty of photos. The Rolls Royce is charged out at £100 per hour making a local wedding £300 and the Aston Martin DB5 is £500 for a wedding within a 10 mile radius of Dartington. Please call us on 07918715039 for more details. We supply white bows to put on the car but if you have something special in mind just let us know. As long as the car is not damaged! You are very welcome to come and take a look at our cars just give us a call and we can arrange a suitable day/time. 1. The hiring company cannot accept responsibility for adverse weather conditions, or acts by other persons or organisations outside of the hire company’s control which may impact on the hire period. 2. Whilst every effort is accorded to maintain the serviceability of the vehicle, responsibility cannot be accepted for mechanical, electrical or material breakdown whatsoever. In this unlikely event, every effort will be made for the immediate repair of the vehicle or the supply of a replacement vehicle. If this is not possible or is deemed unacceptable by the customer then a refund of monies paid can be granted to the hirer. In the event of breakdown, traffic congestion or accident, no responsibility will be accepted for missed connections and/or functions how so ever caused. 3. Devon Classic Wedding Cars will take photographs at your event to use for promotional purposes both on-line and off line. Any objections must be notified prior to the occasion. 4. The hiring company maintains a strict no smoking, no food or drink policy in the vehicle. If misused through food, drink or illness a minimum £100 valet charge can be imposed. 5. The customer is responsible for any damage caused whatsoever inside or outside the vehicle by themselves or any other party member during the hire period. 6. Devon Classic Wedding Cars cannot be held responsible for any personal possessions left in the vehicle during the hire period. 7. Devon Classic Wedding Cars reserves the right to refuse entry to the vehicle or to any person(s) they deem unfit for whatever reason and can refuse to continue the journey if any person(s) behave in a manner which may be detrimental to any other person or the vehicle and its contents. In this event, no refund of monies paid will be given. 8. Devon Classic Wedding Cars will not tolerate any person(s) who uses rude, abusive or threatening behaviour towards their staff and representatives at any time. In this event no refund of monies paid will be given. 9. Due to the age and nature of some of the vehicles, seatbelts may not fitted in the rear of the vehicle and in some cases not at all. Children under 3yrs will not be permitted. 10. Please contact us by email or telephone for a quotation. We require a non-refundable deposit of £80 per vehicle at the time of booking. If the hire date is more than 8 months from the booking date we require a 50% deposit at the time of booking. The outstanding balance is required 30 days prior to the hire period and is non-refundable. Any bookings made within 30 days of the hire period must be paid in full on booking. Payment can be made by debit or credit card or by bank transfer. 11. Pricing is based on that agreed between the customer and the hirer and will be confirmed via email giving full details of the service required and the agreed price. 12. 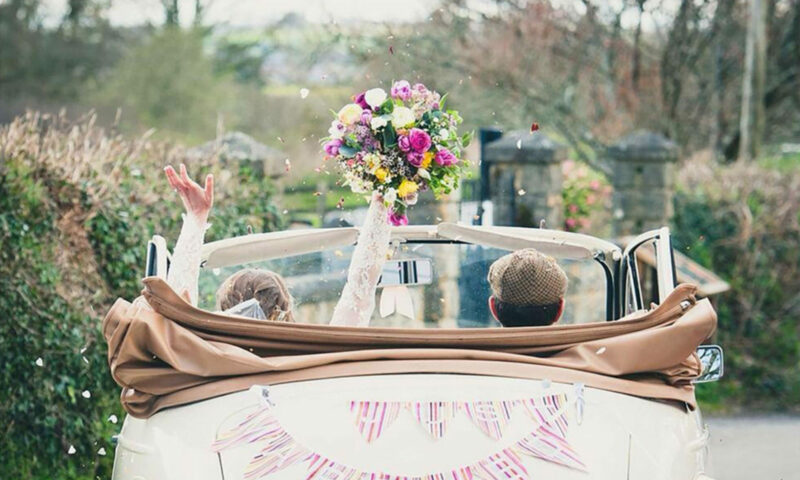 By making a booking you accept all Devon Classic Wedding Cars terms and conditions.